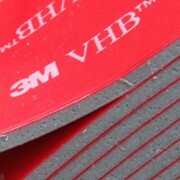 3M™ Spray Adhesives are always ready when needed. 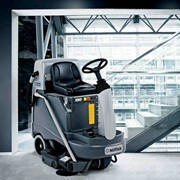 Only a touch of the finger, bonds, cleans, or handles a variety of other jobs. 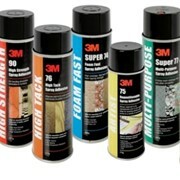 3M™ Spray adhesives also have a controlled spray pattern which helps minimise overspray and clean-up. 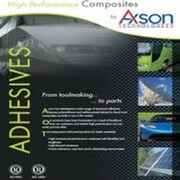 For mounting, bonding, fast-drying and high strength adhesive needs. 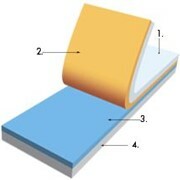 3M™ Spray 73 is ideal for permanent mounting of lightweight materials such as paper, cardboard and fabrics to each other. 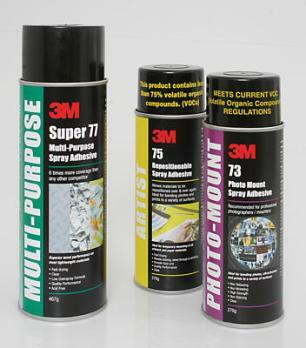 3M™ Spray 74 is excellent for bonding foams and urethanes together and many other materials like wood, metal and plastics. 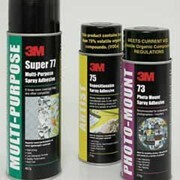 3M™ Spray 75 provides "tape-like" bonds on many lightweight materials. 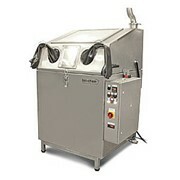 Adheres in seconds yet has an extra-long tack range that allows respositioning. Bonds paper, cardboard, acetates, foils and plastic sheeting. 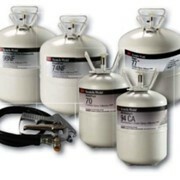 3M™ Spray 77 High tack, high coverage, fast-drying transparent adhesive for permanently attaching foils, carpeting, many lightweight foams, paper and fabrics to painted or unpainted metals, woods and other base materials. 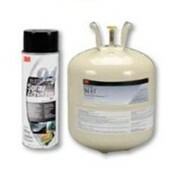 3M™ Spray 80 has exceptional resistance to plasticising oils, bonds rubber and supported vinyls better than many typical bulk neoprene contact adhesives. 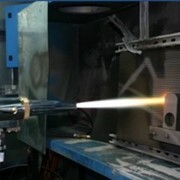 High heat resistance with a 30 minute open time. 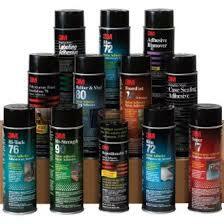 3M™ Spray 700 is a versatile general use solvent an aerosol form. 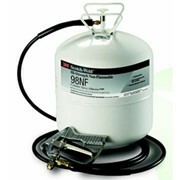 Ideal for cleaning heavily contaminated surfaces prior to bonding, removal of adhesive residue or dismantling of previously bonded articles. 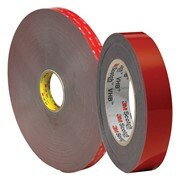 3M™ Spray 300 is an isopropyl alcohol (IPA) spray that cleans surfaces prior to the application of a 3M tape or adhesive, particularly 3M VHB Adhesive Tape.